For those of you who know me, you'll know that this time of year is both my favourite and yet hardest time of year. I am so Christmas crazy that I'm ashamed to admit that one year we even had our tree up in November! (Not my finest hour and not something I will be repeating...pinky promise.) However, with the longer nights and the colder weather, I also suffer much worse with my health anxiety. However, last year I stumbled upon the art of hyyge. It really has helped me to marry the best and worst bits of winter into a more manageable package. It has allowed me to strip back the unimportant things and invest my time and energy into the quiet and pleasurable activities with my family whilst enjoying all the cosy and snuggly things that the festive season brings. This brings me on to this wonderful recipe. It's traditionally a Swedish version of mulled wine with extra ingredients like nuts, dried fruits and liquor. However, since we don't drink alcohol and we like to involve the kids with all of our festive traditions we have adapted the original to a family-friendly alcohol-free version. 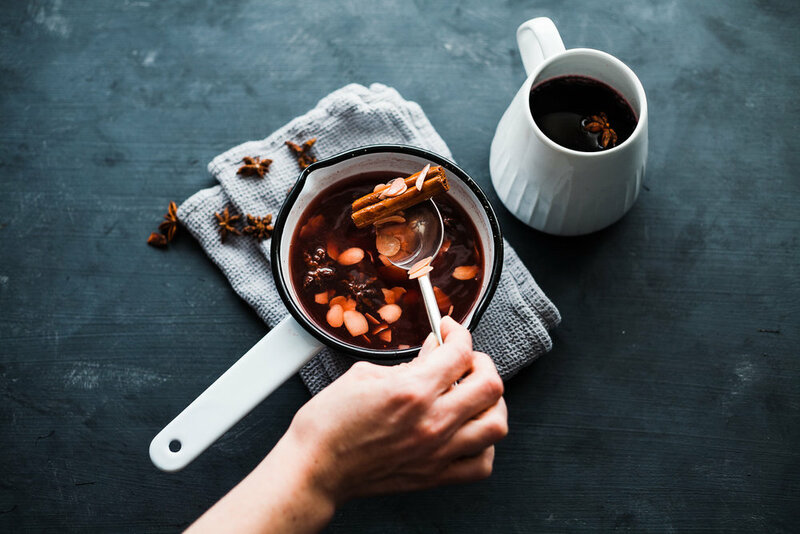 This recipe is so warming and is the perfect treat to take in a flask on a long walk out or to enjoy whilst snuggled in bed with your best book. When cooking all the ingredients it fills your house with the smell of Christmas and is like a welcome blanket to any friends or family you invite over. This is going to be my go-to recipe for helping keep me relaxed and hydrated this festive season whilst ticking all the boxes for my need to bring Christmas here as early as possible! Prep time 10 minutes. Cook time 10 minutes. Simply add all of the ingredients into your favourite pan and gently heat until all of the flavours have combined. (About 10 minutes.) You could also double up the quantities and pop on low in the slow cooker for a couple of hours. What a lovely smell to greet you on your return if prepared this way. If you are serving to very small children then be sure to strain the pieces out before giving it to them and of course always check it's not too hot for them too. I really hope you enjoy this drink as much as we do. We are planning a pre-Christmas day dash down to the beach for a mind cleansing walk before the madness begins and we will be sure to be packing a flask of our glogg to warm our sandy toes and excite our festive souls this year. So whether you're trying to cater for the designated driver at your Christmas party or you're just trying to find a healthier way to celebrate this Christmas, this hyyge in a glass is just for you. Get cosy, stay relaxed and have a happy hyyge Christmas.